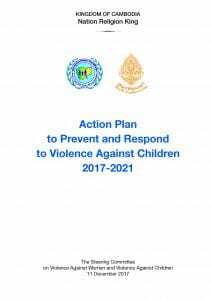 The Royal Government of Cambodia has launched its Action Plan to Prevent and Respond to Violence Against Children 2017-2021. The Action Plan has been formulated following the 2013 Cambodia Violence Against Children Survey, the first countrywide study, and the first regional study in the East Asia Pacific region, to provide evidence on the magnitude and nature of the different types of violence experienced by children in Cambodia. The Action Plan was coordinated by the Ministry of Social Affairs, Veterans and Youth Rehabilitation and the Ministry of Women’s Affairs in partnership with government ministries and agencies represented in the multi-sectoral Steering Committee on Violence Against Women and Violence Against Children and its Technical Working Groups. In 2015-16, Coram International carried out the literature review, research, secondary analysis and theory of change on VAC in Cambodia, which is the basis of the Action Plan. The activities outlined in the Action Plan are designed to help support efforts in Cambodia to develop and implement effective child-friendly prevention strategies, as well as to improve service provision for all Cambodians, especially children, who experience violence.